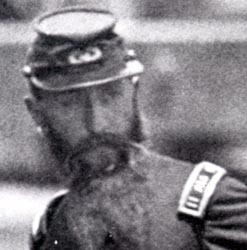 A minority of Civil War surgeons wore the letters "M.S." (Medical Staff) on their shoulder straps. There was very little written mention during the period of this practice. The regulations do not mention wearing any letters on shoulder straps, but letters were worn on epaulettes by members of the medical staff and paymaster's department. One fault of the regulation uniform was that members of the various staff departments had little to distinguish their department affiliation. Surgeons, paymasters, quartermasters and even some chaplains all wore the letters U.S. in a wreath on their hats and shoulder straps with dark blue fields. It appears that some officers took matters into their own hands and had shoulder straps made with the abbreviations of their departments on the field. No authority is known to exist approving this, but since officers purchased their own uniforms and there was practical valve in knowing whether you were addressing the regimental surgeon or the quartermaster, the practice appears to have been tolerated. Artifacts and photographic examples for these exist for nearly every department that used staff shoulder straps. Surgeons straps are perhaps the most common. It is interesting that among the evidence that can be cited is the painting by Winslow Homer titled Playing the Old Soldier. 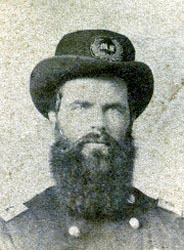 Homer was a war correspondent and spent time at the front. He was an artist with an eye for both detail and the humor to be found in camp life. "Playing the Old Soldier" was a period term for malingering. Claiming to be ill was a way of avoiding duties in camp or battle. In addition, many period medications contained alcohol and often soldier presented themselves with symptoms that were known to be treated with liquor. The surgeons were fast to catch on and just as often dosed the suspected malingerer with something unpleasant. The painting above captures the encounter of the regimental surgeon and an "old soldier." Physicians of the time believed that the tongue held many clues to a persons health. Detail of the surgeon's shoulder strap shows that it has the gold leaves of a major (typical rank of a regimental surgeon) with the letters "M.S." between them. The surgeon's uniform is not shown in great detail. It appears to be a single-breasted frock coat with a rolled collar. This is despite the officer being a major, who should be wearing a double-breasted coat if this were a regulation frock coat. No buttons are visible on the cuff, which is unusual . His pants are the correct dark blue of a staff officer rather than light blue of a line officer. He is wearing boots with boot straps on the outside. The two enlisted men are wearing sack coats and the correct light blue trousers. The recorder's kepi shows the regimental number "61" and the company letter "B." 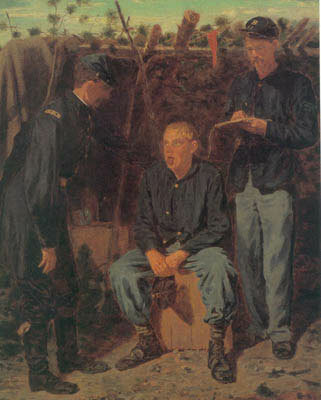 The soldier is depicted as a member of the 61st New York Infantry, which was commanded by Francis Channing Barlow, a Harvard classmate of Winslow Homer's brother Charles Homer. 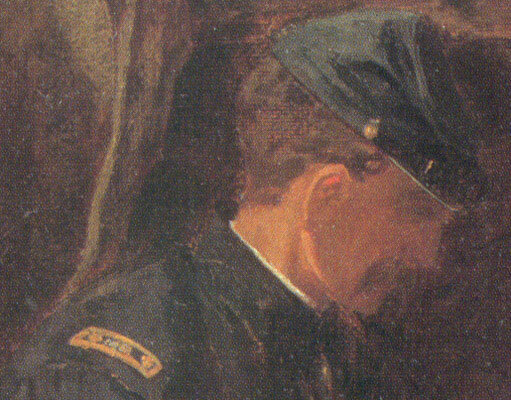 Soldiers wearing insignia of the 61st often appear in Homer's paintings. The existence of nonregulation medical staff shoulder straps with the letters "M.S." does not rest with one painting. A number of dated period photographs exist and images of a number of artifacts straps have been published. Artifact straps can be metallic false-embroidery as in the above example or can be made of true embroidery. Generally Surgeons held the grade of Major and Assistant Surgeons of First Lieutenant or Captain. For more information consult Dr. Gordon Dammann's Pictorial Encyclopedia of Civil War Medical Instruments and Equipment Volume One and Two. Both of these books include a chapter on surgeon's uniforms and insignia with many examples. My publication Straps also includes other examples. In addition to shoulder straps, the letter "M.S." were also sometimes worn on headgear in place of the "U.S." in staff officers' wreaths. This was also a practice not condoned by Regulations and something also done by members of other staff departments. Other examples of hat wreaths with the letters "MS" can also be seen in Dr. Dammann's book.